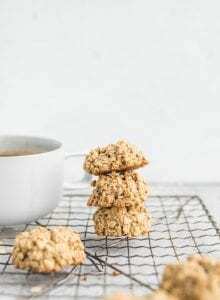 Make these easy, healthy cookies when you need a sweet treat asap. All you need is one bowl, 20 minutes and 3-ingredients. They’re crispy on the outside and soft on the inside with delicious maple flavour. Pre-heat the oven to 350 degrees and prepare a baking tray. Mix the ingredients together in a mixing bowl until they form a dough. The dough will be very sticky, that’s ok. If it seems to dry, add a bit more nut butter, if it seems to wet, add a bit more oats, we’re looking for a sticky cookie dough consistency. Use wet hands to drop the dough into 9 equal-sized cookies on the baking sheet. I left them in little mounds but you can press them down a bit if you like. Bake for 15 minutes then allow to cool before handling. Store at room temperature for up to 4 days or in the freezer for up to 3 months. You can sub tahini, almond butter or peanut butter for the sunflower seed butter as long as it’s fairly drippy and not too dry.